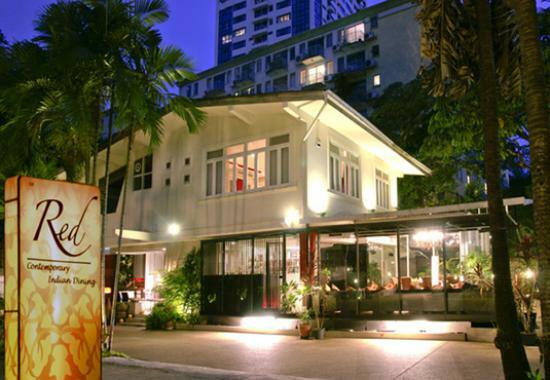 In the more than five years that we have lived in our medium-sized condo, we have seen the 1950s house next door transition from being an Indian restaurant to K-Pop nightclub. Now it is set to make its next metamorphosis and become a community mall. The house, as you can see in this borrowed picture above, was a beautiful “tropical modern” style, very common in this neighborhood which was, in the 1950s, a fashionable place for well-off families to build their weekend “country” home. Of course, back then this area of Bangkok was truly on the outskirts of town. When we arrived a half-decade ago, it was a contemporary Indian restaurant that didn’t ever seem busy but did do a good job preserving the architecture of the building. Then about a year ago, we were informed it was going to become a “the world’s first K-Pop pub”. Much to the consternation of our residents, a new tenant built an exterior shell around the house and turned it into this gaudy sight. Our condo’s management, along with other nearby residents, used all available legal channels to block their operation and ultimately, they opened only a handful of nights before shutting down. Part of me wonders whether it was ever actually meant to be a legitimate business, as the idea of putting a pub in the midst of a residential area was ill-conceived from the start. Recently, construction has started again. The exterior of the pub has been pulled down and you can see that the old house remains. After a week or two of initial curiosity, we were finally informed what will be built there. The new space will be a “community mall” – the term used locally to describe these smaller-scale open air shopping centers that may have at most one or two dozen shops, a limited amount of parking, and restaurants and light retail. Quite a number exist within a five- to ten-minute walk from our condo, so I’m not sure what the need is, but I suppose it is a better use of the space than a K-Pop nightclub. According to the plans, the original house will still be incorporated in some way, although from these two elevations, I don’t see where. Anyhow, that’s what’s happening next door. How are things where you are? This entry was posted in Expat Life and tagged Bangkok, Community Mall, condo, Construction, house, K-Pop, Mall, Nightclub, Pub, shopping, Urban Development by christao408. Bookmark the permalink. I lived next to the construction site of a huge condo complex for two years. The nuisance from nearby construction is super high. From how I recall your neighborhood, this mall might lead to more traffic once opened. Well, the street is already fairly busy so that may not change much. I’m hoping that there is a coffee shop, a few nice restaurants, etc. May actually increase our property values a bit. Interesting post & pictures. It’s amazing that the original structure of the house is still there – you would have thought they’d bulldozed the whole thing. The last picture looks like a small villa, or a small apartment building to me – I guess it’ll match the residential buildings. I live in suburbia, but there was a big patch of land that was for sale a couple of months ago – I think someone purchased it. I bet they’re going to build a big a massive apartment building there, although I hope not, because all the houses in my neighbourhood are either single or double storey detached houses. I used to love my neighbourhood until I had a bad brush with a neighbour – now all I care about is that they build things that raise the property prices – a massive apartment building would lower it, I think. I hope they just separate it into smaller lots, so that more detached houses can be built. I wonder, though, if adding greater mix to the housing stock might actually increase the value of the neighborhood? It’s sad that some of the old houses and buildings are demolished. We don’t have a lot of old buildings left in the city. It always seems to be a constant battle between developers and the small group of Councillors along with the historical group (can’t remember their name) that try to preserve some of these older buildings. In my ‘hood, there’s quite a lot of development with many pressures on traffic and public transit. There are still a lot of nice older houses and buildings. From what I’ve seen, it seems like TO does a pretty good job maintaining the historical character of the neighborhoods. I think they are charming. Progress, they call it. Huh! I remember when it was Red! What a beautiful home and so sad to see its old beauty gone. This reminds me of Vanilla Garden and I’m sure what’s replacing it will try to be like JVillage et al. Funny, I just drove through LA tonight with my parents and reminisced of once was. I think they are particularly trying to emulate Seenspace on Thong Lor 13. 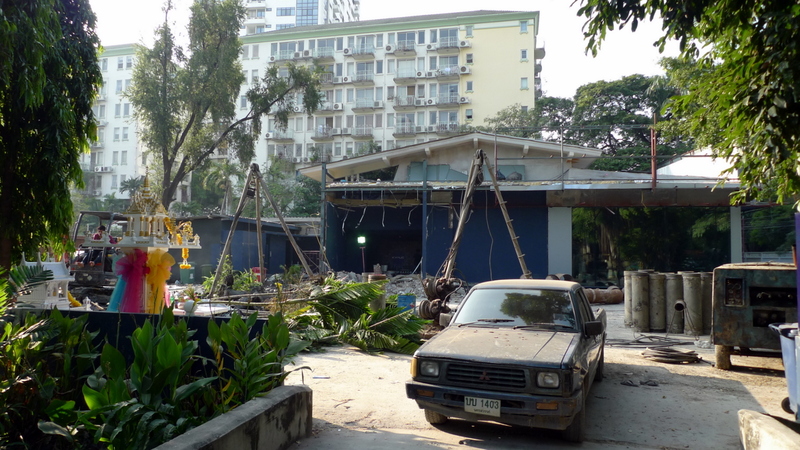 There’s another place going up on Thong Lor opposite the mouth of Soi 5 – used to be the complex Beccofino was in. I would much rather have a mall than a club. I am impressed by the way they use vacant buildings there in a useful way. Been a calm week end here with ice and snow that is gone today. You and Tawn have a wonderful week end. Thanks – I agree that the mall is better than the disco. Sounds like a much better place to be, especially over the winter! i prefer the look of the 50s house that used to be an indian restaurant. then again, the new to-be mall could be worth a regular visit than an indian restaurant. The reality is the Indian restaurant had a poor reputation as being overpriced. I guess it is better that there be something useful there, even though it is a shame the house will no longer be visible. such a shame indeed. it’s like loosing a valuable historical piece of the neighborhood. Other than a noisy warehouse across the road, very well. I have a neighbour who likes to jam on his guitar with his mates at all hours of the night…le sigh! I really don’t understand the obsession with building malls. There seems to be a mall popping up every second day in India too. I’m not sure, either. Seems like there are already too many places to buy things. 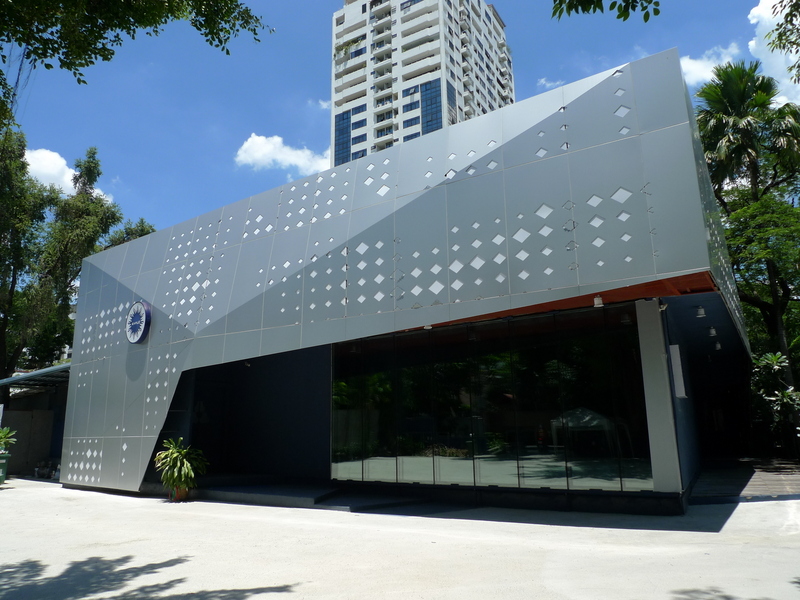 The community mall is called 9:53 and it is at the corner of Thong Lor Soi 9 and Sukhumvit Soi 53.